San Francisco, also known as the “City by the Bay”, is the second-most densely populated city in the United States, behind New York City, and is one of the most popular tourist destinations in the world. This metropolis of finance, art, culture, and tourism has limitless advertising and billboard possibilities. 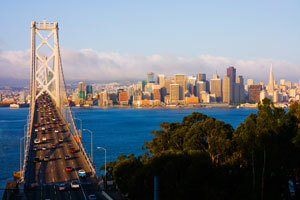 Tourist attractions like Alcatraz Island, AT&T Park, and the San Francisco Zoo draw thousands of consumers to San Francisco every year and allow for very effective advertising opportunities. Billboards near these attractions will yield high traffic and exposure potentially growing your business. Billboard ads on Interstate 80 and on U.S. Route 101 would capture the locals as well as these tourists. If you are targeting a different audience, there are a myriad of out-of-home advertising options in downtown San Francisco. The War Memorial and Performing Arts Center, the San Francisco Opera, and many other institutions have created a culture prime for local advertisement and cinema advertisements. Zip Codes: 94101, 94102, 94103, 94104, 94105, 94106, 94107, 94108, 94109, 94110, 94111, 94112, 94114, 94115, 94116, 94117, 94118, 94119, 94120, 94121, 94122, 94123, 94124, 94125, 94126, 94127, 94128, 94129, 94130, 94131, 94132, 94133, 94134, 94135, 94136, 94137, 94138, 94139, 94140, 94141, 94142, 94143, 94144, 94145, 94146, 94147, 94150, 94151, 94152, 94153, 94154, 94155, 94156, 94157, 94159, 94160, 94161, 94162, 94163, 94164, 94165, 94166, 94167, 94168, 94169, 94170, 94171, 94172, 94175, 94177, 94188.